Last night, Drake finally gave the world the official visual for the standout Scorpion track,”In My Feelings”. Complete with cameos from viral sensation Shiggy and Howard University alumni Phylicia Rashad and La La, Drake (in what looks like a Florida A&M Rattlers basketball jersey) continues his impressive streak for iconic hip-hop music videos. Over her 20 plus year career, Beyonc visuals have evolved and her current perspective is within the confines of Black women empowerment. Drake’s been doing the same, but his recent streak leans into his own personal nostalgia that his audience can’t get enough of. Drizzy threw it all the way back by reuniting the cast of Degrassi High in his “I’m Upset” video, then paid homage to Black women of all hues in his “Nice For What” video and topped it off by morphing into a walking beige Santa Claus to those in need on the streets of Miami in “God’s Plan.” We call that a threepeat. 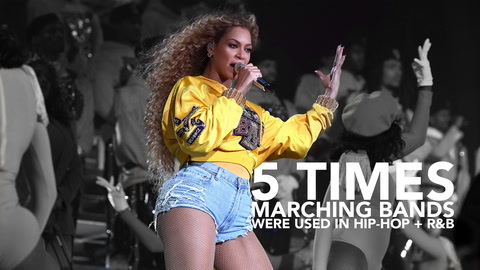 HBCU culture has a played a role in defining these two stars’ respective video timelines and has been placed on the world stage for all to observe and breathe in, including Beyonce’s most recent Coachella (Beychella) performance. But one thing is for certain. Hip Hop and HBCUs will always go hand in hand.